Craftin' Caro: Fun Halloween Treats ideas..
Have you noticed the new 1" x 8" Cellophane Bags being offered in the Holiday Mini Catalogue? 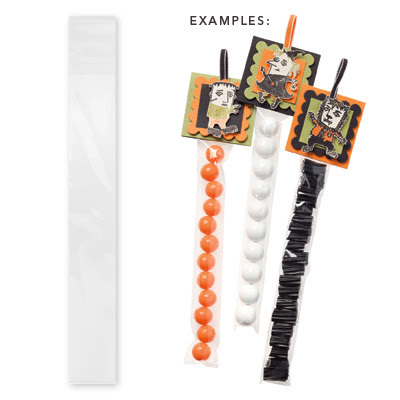 These narrow cellophane bags are perfect for filling with a row of treats, a pencil, or anything! Great for fast and easy gifts — just add a tag or topper you’ve created using any punch or Big Shot die. Adhesive on top keeps everything inside. Each measures 1" x 8" and come 50 per package. The Howl-O-Ween Creeps set was a perfect one to use for the toppers. 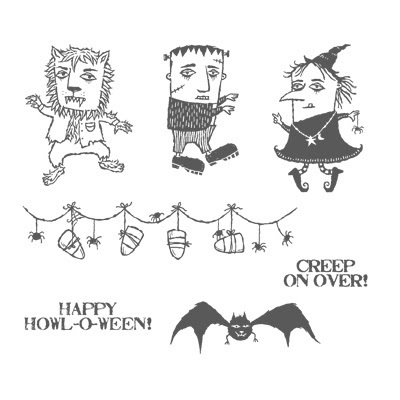 Create an instantly eerie atmosphere with this fiendishly fun seven-piece stamp set. Great for both kids and adults, this whimsical set features the wolfman, Frankenstein, a dancing witch, and more!